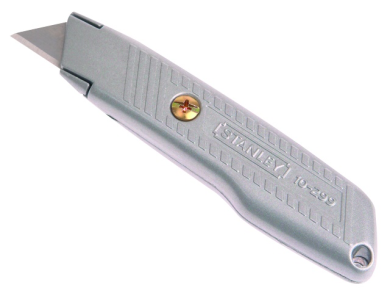 Stanley Fixed Blade Utility Knife - Industrial Plasters Ltd. The well-known 10-299 Stanley fixed blade utility knife, with a metal grooved body for secure handling. It incorporates the 'interlock' patented blade locking system for greater safety during cutting and is supplied with 3 blades, stored within the handle.